One recent addition to the collection is Two Women / Dos Mujeres. 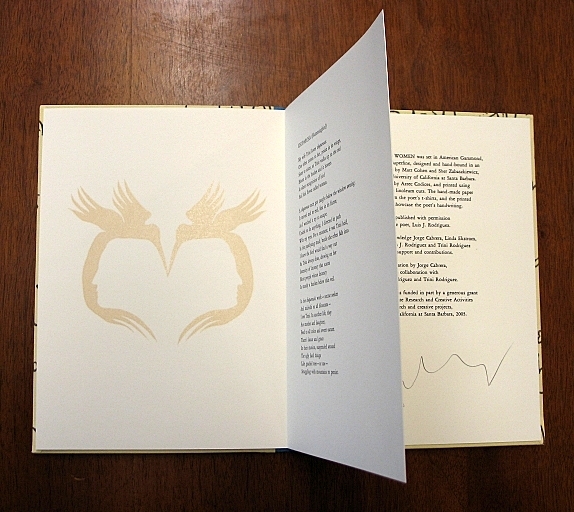 This work is a collaboration between a poet, Luis J. Rodriguez, and two book artists, Matt Cohen and Sher Chyrk Zabaszkiewicz. Rodriguez is a prominent Chicano writer in the United States publishing fiction, nonfiction, children’s literature, and poetry. Rodriguez was born on the U.S./Mexico border and is of Mexika/Raramuri indigenous descent. When he was two, his family migrated to South Central Los Angeles. In the 1960s and 70s, Rodriguez was a street gang member in the East Los Angeles area, which he later documented in his most well-known work, his memoir Always Running: La Vida Loca, Gang Days in L.A. He eventually pulled himself out of the gang life and established himself as a writer and poet. More about the author, his achievements, and his awards can be found on his website. 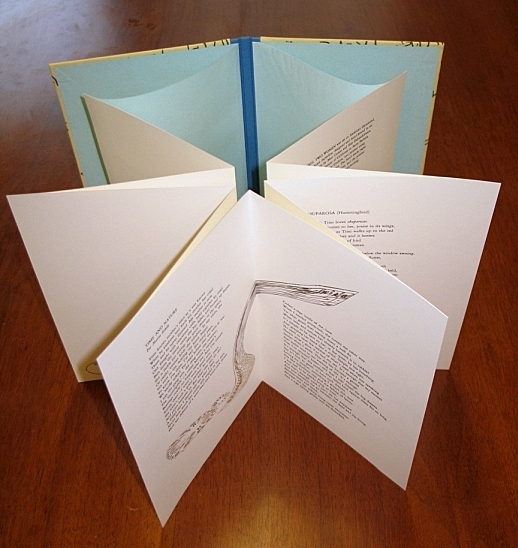 Two Women/Dos Mujeres is from a series of artists’ books using Rodriguez’s poetry. The cover panels of the book are printed with an etching press and feature the handwriting of the poet. Inside, the end sheets are made of handmade paper which incorporates fabric from the author’s t-shirts. The book is hand-bound false accordion. This means that a series of pages are folded together which is then hinged into its cover. This allows the finished book to be read by either turning the pages one after another, as with most codices, or spread out in order to see the entire work all at once. 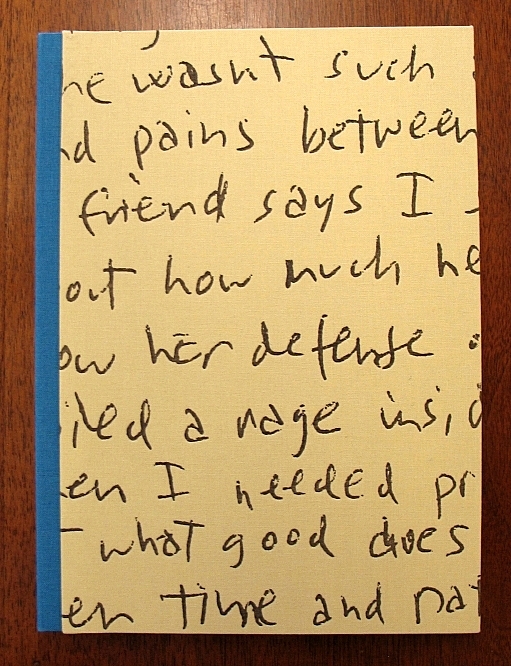 Binding is often an important element in artists’ book and this is indeed the case with this title. The book artists chose the false accordion so that as the reader views one page, the next page in the sequence has already started to turn. Thus, the viewer cannot read what is on one page, without first being aware of the oncoming page. This relationship is directly related to the two women of the title, Rodriguez’s mother and his wife. 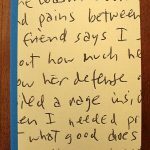 The book includes two poems, one for each of the most important women in the poet’s life. As the pages are bound to each other, so are the influences of Rodriguez’s mother and his wife. Thus the reader cannot look at one without being aware of the other. Interspersed among the text are images that are drawn from the Aztec heritage of the poet. As a result, the entire artists’ book is a very personal embodiment of elements of the poet’s life, from his handwriting on the cover, to paper created from his own clothing, to the poetry and imagery, down to even the binding of the book. Two Women/Dos Mujeres serves as an artistic work drawing in biographical elements of a Latino American poet. The AA/PG library is delighted to add this book to its collection as it serves as a fine example of an American life and story. Previous Post Altmetrics: the cat’s meow?